Cytomegalovirus: Is There Anything New under the Sun? With so much success in controlling cytomegalovirus (CMV) disease, one feels almost ungrateful to furtively whisper that there is more yet to do. Still, there is the inconvenience and expense of intravenous regimens, there are toxicity issues with current regimens, and we still face late CMV disease, which is growing in frequency. Increasingly, we have also become aware that CMV-seropositive patients who undergo transplantation — even if they do not experience overt CMV disease — are at increased risk of dying in ways that are not readily apparent. 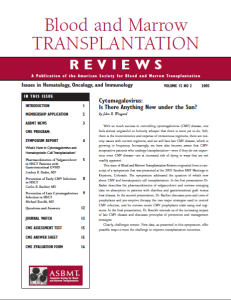 This issue of Blood and Marrow Transplantation Reviews originated from a transcript of a symposium that was presented at the 2005 Tandem BMT Meetings in Keystone, Colorado. The symposium addressed the question of what’s new about CMV and hematopoietic cell transplantation. In the first presentation Dr. Baden describes the pharmacokinetics of valganciclovir and reviews emerging data on absorption in patients with diarrhea and gastrointestinal graft versus host disease. In the second presentation, Dr. Bachier discusses pros and cons of prophylaxis and pre-emptive therapy, the two major strategies used to control CMV infection, and he reviews recent CMV prophylaxis trials using oral regimens. In the final presentation, Dr. Boeckh reminds us of the increasing impact of late CMV disease and discusses principles of prevention and management strategies. Clearly, challenges remain. New data, as presented in this symposium, offer possible ways to meet the challenge to improve transplantation outcomes.